m. 31 December 1858			F. Andrieux  p. omi. godfather ; Xavier Robillard, godmother: Milie Richart                             Mourier p. omi. Note: Father Regis Deleage had been the parish priest at Our Lady of the Visitation church at South Gloucester (Ottawa now). near Maniwaki, is named after him. Prêt-à-Boire /Prêtaboire, from St.-Gabriel parish(Bouchette,Quebec). godfather. : Joseph Fortin,   godmother. : Desanges Mathieu                              D. Reboul p. omi. b. 20 Feb. 1851 at Riviere du Lievre, (i.e. now the Mont-Laurier area, I presume) born Dec. 1st. Witnesses: Daniel Obstead &  Marguerite Dormer. at Ste-Famille d'Aumont, 21 July 1887.
b. Feb. 3, 1869, born the "eve"
b. Nov. 24, 1870 , born the 20th. margin notes: married at Maniwaki on the 27th of Aug. 1910, Rose Anna Riel, baptized at Lac Ste-Marie around 1893.
b. June 29, 1874, born the "eve"
Note: See another Robillard page. or 1873 in Maniwaki and Elisabeth Boutin (born 14 Aug in 1875) in Maniwaki. find out more about them. can you help me where to search for further information? with Anne, Olive Robillard (daughter of Pierre Robillard). thanks so much. August 21, 1954. Her parent were Marcelline Jette and Joseph Robillard. When I look in your document on the Robillard Family she is not listed anywhere. Blanche Belanger was born of that marriage in Troy, New York on September 20, 1887. Wilfred married Aline Ethier, and they had a son, Jacques. on my grandmother's side back to when they came to Canada in 1642. Does any of this connect? of these people please help me. wonder if you can help me in a way. to work with them to care for the victims of the Irish Famine. 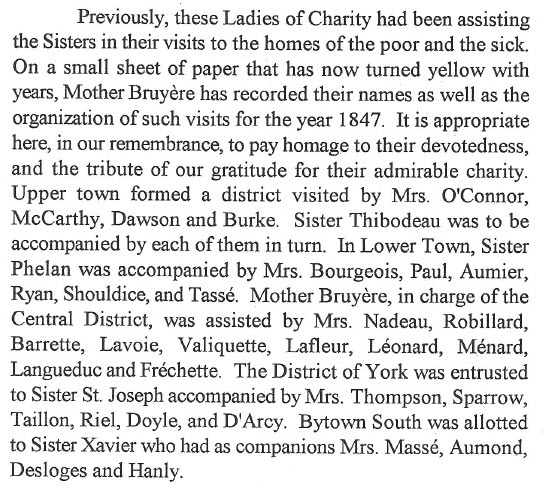 Here are some of the families who stepped up in 1847. A Mrs. Robillard was one of the volunteers.